Fit Bike Co. have released their Hartbreaker frame in this new Clay Brown color! Is it time for a new frame and you want something built for trails? The Chris Harti signature Hartbreaker frame from Fit Bike Co. is now available in this new Clay Brown colorway through BMX shops and mail-orders worldwide. If you aren’t familiar with the Hartbreaker frame, it’s made in the U.S.A from full 4130 chromoly tubing with a 74.5-degree head tube angle, 71-degree seat tube angle, 11.35″ bottom bracket height, 9.15″ standover height and a 13.8″ – 14.5″ chainstay length. You can find an engraved Key logo Integrated head tube, gussets on the top and down tubes, a butted Supertherm top tube, straight gauge Supertherm down tube, a double butted seat tube with a cable guide through the tube, slightly tapered seat stays, slightly tapered and single bend chain stays, longer drop out slots and welded on chainstay brake mounts. The Hartbreaker frame comes in 21″, 21.125″, 21.25″ and 21.5″ top tube lengths with Clay Brown and Matte Black for colors and a price tag of $369.99 through BMX shops and mail-orders worldwide. “The Hartbreaker is Chris Harti’s long, low and laid back shred sled designed for going fast and big at the trails with stability. Cable routing thru the seat tube keeps your straddle hanger from slapping your down tube and works really well on this frame since the chain stays are pretty long. The 14mm drop out slot instead of the traditional 3/8” trail frame slot allow you a larger variety of affordable rear hubs to choose from. 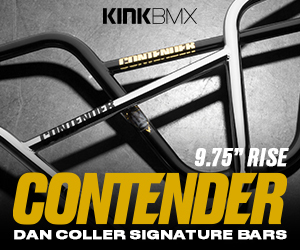 Single bend chain stays, straight stay bridges and lack of welded on seat clamp are all classic touches on this modern frame designed for timeless BMX riding.” – Fit Bike Co.
Posted: June 28, 2018 Tagged With: BMX frame, Chris Harti, Fit Bike Co.